I’ve been dealing with the situation when your server redirects after a DELETE. Which is actually a fairly common use case. User deletes a blog post, redirect them to the index of all posts. The article below has some Rails workarounds, but is relevant to anyone using XHR and perhaps HTML5 History, ie many single-page web apps. It’s important stuff to know if you’re HTML5ing in earnest, because there was a recent change to Chrome which makes it standard-compliant, but fundamentally different to other browsers and also makes it handle DELETE and other verbs different to how it handles POST and GET. This redirection becomes troublesome if you want to do this in a way which will seamlessly support Ajax calls, as well as standard web requests. It’s troublesome because of a lethal combination of two browser facts. Secondly, a DELETE request, when it’s redirected, will actually cause another DELETE request to the new location. Yes, if you’re redirecting to the index, congratulations … your server now receives a request to DELETE the fraking index. You lose!!! So the very normal thing to do for a non-Ajax app suddenly becomes an epic tragedy. It’s completely unintuitive, but it’s actually the standard! I learned as much by filing an erroneous Chrome bug. Turns out Chrome’s unintuitive behaviour is actually correct and Firefox and Opera were wrong. Even more confusing, I was seeing POST requests being converted to GETs, and it turns out this is also part of the 302 standard – POSTs can be converted to GETs, but not DELETEs (or PUTs etc I assume). Just now, I made a little workaround which seems to be working nicely in my case. In my AppController, which is my app’s own subclass of ActionController, I simply convert any 302 response (the default) to a 303, for redirect_to calls. I should maybe do this for XHR calls only, to be “pure” when a normal call comes in, but no real difference anyway. While I’m blogging this, let me tell you about another related thing that happens with redirects (this section applies to any type of request – GET, POST, DELETE, whatever). As I said above, XHR will automatically follow requests. The problem is, how do you know where the ultimate response actually came from? XHR will only tell you where the initial request went; it refuses to reveal what it did afterwards. It won’t even tell you if there was any redirect. Knowing the ultimate location is important for HTML5 apps using the History API, because you may want to pushState() to that location. The solution is to have the web service output its own location in a header. Weird that you have to, but gets the job done. Today’s buzzword gotcha is brought to you by WebWorkers, Cross-Domain JSONP, and CoffeeScript. TL;DR: Always use “self” for WebWorker “globals”. And a library. Firstly, WebWorkers don’t do JSONP the normal way. You can’t inject a script because there’s no DOM. This means you can’t even use standalone JSONP libraries, let alone jQuery (which doesn’t even run in a WebWorker, as it assumes DOM presence, and would be a waste of bandwidth anyway). In fact, Chrome gives a mysterious error “Uncaught undefined”, while Firefox cuts to the chase: “go is not defined”. The reason is that the CoffeeScript compiler wraps the entire thing in a closure. This is tremendously useful default behaviour, as you don’t have to worry about adding new globals, but can cause problems in situations like this. If the script comes back from Twitter and calls “go()”, where does that actually end up? With the main thread, a CoffeeScript can explicitly bust properties out of the closure using the global namespace, i.e. 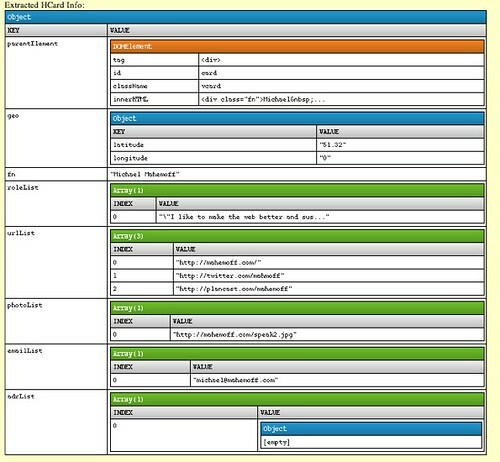 “window.foo” (or “global.foo” in the case of a server-side Node script). In fact, there’s a solution to this with WebWorkers too. have their own global identity, “self”. “A” is for Asynchronous, Again. I think it sums up a key point about Ajax, which is sometimes overlooked: Asynchrony. One of my first posts on Ajax, back in 2005, covered it, but it still took years to really sink in. At the time, I was thinking mostly of “Asynchronous” as XHR’s asynchronous mode, so seeing it in contrast to running XHR synchronously. 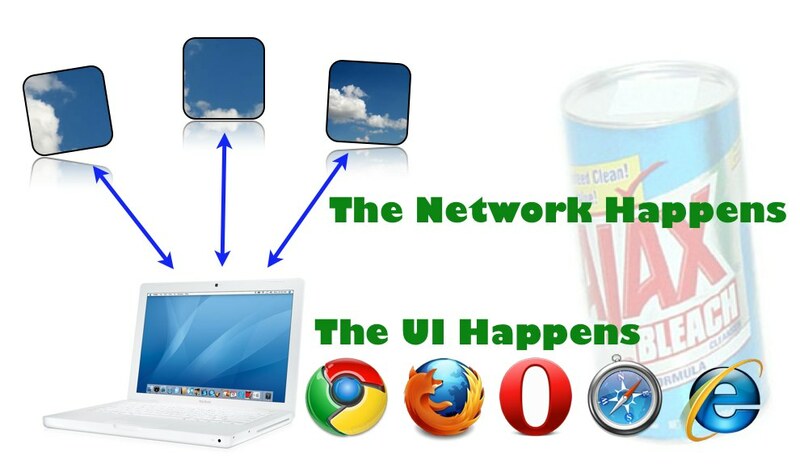 But really, the big deal about Ajax is the UI can carry on, while networking happens in the background. That’s what makes filling out forms faster and what makes tools like Google Docs possible, especially in multi-user mode. Although it was created back in 2001, we could do far more with it in 2004 (e.g. Google Maps) than we could in 2001, and we can do far more with it in 2010 than we could in 2004. I cite the 3,286 day old application as an example because it’s the one browser that’s still around and still must be targeted by a significant number of developers (despite the best intentions of even MS employees to “drive a stake into IE6s heart”, and thankfully, the number is starting to dwindle). It’s the 120-year old who’s witnessed the transition from horse-and-cart transportation, to men on the moon, and is still here today to speculate on the eagerly awaited ChatRoulette relaunch. We could ask how effective Netscape Navigator development is in 2010, but since no-one actually does that, any answers would be hypothetical. IE6 is something many people worked with pre Ajax era and something some people still work with post Ajax, so it’s a specimen that can be used to show how Ajax changed the world. In the Ajax era, we made like engineers and got smart about how to do the best we could with the laws of physics our universe imposed on us. (Versus the new HTML5 era, where we build a better universe.) I decided to make this post to be a bit more explicit about why IE6 development is significantly better today than when IE6 came out. And by “better”, I mean faster and more powerful, if still a slow, frustrating, and not-very-powerful development cycle compared to the modern browsers. 7. Performance IE6 is orders of magnitudes slower than today’s browsers, so managing performance is certainly important, and these days, we know much more about how to make web apps run faster, thanks to the efforts of Steve Souders et al. 6. Tools Tools from MS and others have come along over the years to improve the development experience. Firebug or Webkit Devtools they are not, but at least IE6 debugging is more than just alert boxes these days. 5. Developers, Developers, Developers Finding savvy web developers these days is vastly easier than it was pre-Ajax, when front-end development was a black art. 4. Show Me the Source We now have plenty of examples to learn from, both online, where View Source is your friend, and in the open source code repositories of the world. 3. Browser Mechanics We understand the quirks of each browser much better now, and that certainly includes the many well-documented quirks of IE6 and how to deal with them. 2. Attitude Those examples also overcome the psychological barrier, a key impediment to IE6 development. In the absence of any decent examples, it was easier for developers to shrug their shoulders and say it’s all too hard. If that sounds too mystical, see 4 minute mile. “Ajax” is more than a set of technologies, it’s also the recognition that these kinds of apps are possible. 1. Development is Just Easier These Days. No matter what kind of development you’re doing, development is just easier in 2010. Blogs, Forums, Twitter, Code Repositories, etc are improved, so this will impact on IE6 development or any other form of development, though there’s a law of diminishing returns here. IE6 development is still a tough effort and thankfully becoming less of a requirement as people shift to modern browsers, or at least IE8. You know a browser is on its way out when “because employees are less likely to use Facebook” is one of its most compelling advantages. The Ajax era had a profound effect on the way we develop and what we know to be possible, but that era is mostly over, and that law of diminishing returns is kicking in hard. Hence, we make a new, better, platform to keep progressing what’s possible. Will the rush of HTML5 work make IE6 development in 2020 even more doubleplusgood than in 2010? Not really. There will be a few odd improvements, but overall, HTML5 is about improving the platform, which means developers will increasingly be focused on doing things IE6 will thankfully never even try to do. The HTML5 world subsumes the Ajax world, so you get the double benefit – all of these ten Ajax benefits multiplied by all of the new features of the platform. Jump straight to the demo. This has been available for a couple of years now, but I don’t see people using it. Well, I haven’t checked, but I don’t get the impression many sites are offering their content to external websites, despite social media consultants urging them to be “part of the conversation”. It’s like when people make a gorgeous iPhone app, but their website doesn’t work at all in the same phone (cough fashionhouse) . Likewise, if you’ve got a public API, but not providing JSONP/callback support, it’s not very useful either…making developers host their own cross-domain proxy is tedious. It’s cool there are services like YQL and Embed.ly for some cases, but wouldn’t it be better if web pages could just pull in all that external content directly? Except in this case, it’s just not happening. Everyone’s offering APIs, but no-ones sharing their content through the web itself. At this point, I should remind you I haven’t actually tested my assumption and maybe everyone is serving their public content with “Access-Control-Allow-Origin: *” … but based on the lack of conversation, I am guessing in the negative. The state of the universe does need further investigation. Anyway, what’s cool about this is you can treat the web as an API. The Web is my API. “Scraping a web page” may sound dirtier than “consuming a web service”, but it’s the cleaner approach in principle. A website sitting in your browser is a perfectly human-readable depiction of a resource your program can get hold of, so it’s an API that’s self-documenting. The best kind of API. But a whole HTML document is a lot to chew on, so we need to make sure it’s structured nicely, and that’s where microformats come in, gloriously defining lightweight standards for declaring info in your web page. There’s another HTML5 tie-in here, because we now have a similar concept in the standard, microdata. I started out doing a standard XHR, for sanity’s sake. It’s based on the hCard microformat, which really just tells you what to call your CSS classes…I told you microformats were lightweight! The whole idea of the card comes from Paul Downey’s genius Hardboiled hCards project. And I also dump the entire hCard for demo purposes, using James Padolsey’s PrettyPrint. There’s lots more fun to be had with the Web as an API. 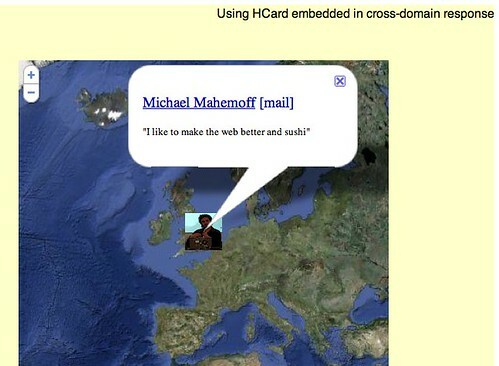 According to the microformats blog, 2 million web pages now have embedded hCards. Offer that content to the HTML5 mashers of the world and they will make beautiful things. 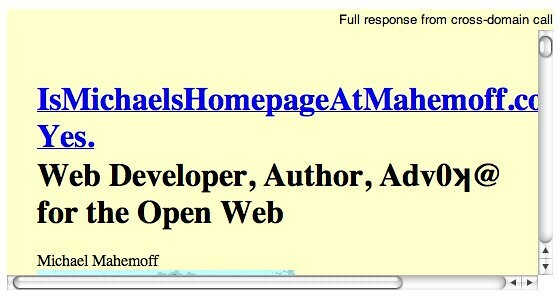 I’m very excited about the role, for reasons best explained in terms of a timeline for the web. I see the history of web technologies divided into three phases and I believe we’re currently in the transition from the second to the third phase. Which is the starting context for this role. Everything changed five years ago, on February 18, 2005. Jesse James Garrett hopped in the shower, came up with the term “Ajax”, and published his thoughts on this rising architectural pattern. Many people bristle at the notion that a simple term, for something people were already doing, can make such an impact. “BUT I already knew how to do that!” they cry. Good for them. But the fact is, Ajax allowed the whole developer community to rally around this style of application. Events, blogs, books, libraries, tools, the whole thing flourished. I got seriously interested, recorded a podcast explaining the topic, and started diving into all the existing applications, which ultimately led to the Ajax Patterns wiki. All those applications, and many featured in the book, were created in the Dark Ages by brilliant pioneers who had scant resources to learn from. Today, such applications can be created at exponentially faster rates. This is thanks to improved knowledge, improved libraries, and improved tools. There are historical analogies to this era, e.g. the rapid rise of the automobile industry once all parts were in place. In that case, it was more a matter of discovering new physical and engineering principles, whereas with Ajax, it was a superficial act. The browsers were already there, with a killer feature like IE’s XMLHttpRequest sitting largely unnoticed for five years. Few people had taken the time to really understand how they worked. It was the Ajax term to trigger the boom. To draw a line in the sand, take IE6. Although it was created back in 2001, we could do far more with it in 2004 (e.g. Google Maps) than we could in 2001, and we can do far more with it in 2010 than we could in 2004. This is because of all the knowledge, libraries, and tools the Ajax Era has provided. However, we’re in serious plateau mode now. We can continue to squeeze out 1-percenters, but the low-hanging fruit was plucked and digested a long time ago. The next stage has to be an improvement to the underlying platform, and that’s what’s going on today with modern web browsers. Once you say “okay we’re now going to build the next-gen web platform”, you’re not just going to add support for round corners. So there’s been a truckload of effort going on, in HTML5 and beyond. Graphics in the form of canvas and SVG and WebGL and CSS3, media in the form of audio and video tags, semantic markup improvements, new form controls, offline storage, support for location-awareness. And much more. We have the new platform and alongside it, we have the activity of understanding how to use the new platform. Not just understanding the parts, but the whole. How do you put all these things together in meaningful ways. Can we show custom-font text on a canvas? If so, how? And when does it make sense? And how to avoid performance problems? Or, to take another example, what kind of CSS transforms can we use to render videos? And since we can grab image data from the videos, what are some cool things we can do with that data? And all the while, where’s the graceful degradation story here? How do these apps look in older browsers? Most of the talk so far has been on the capabilities of the platform, not patterns of usage. All these new capabilities take us to the place we’ve been aiming for all along: true applications deluxe, not just “html++”. Of course, there’s plenty of room for both of these, but we’re now in a place where we can really build true applications with all the capabilities of a traditional native experience. We’re seeing it in a big way in mobile space. The new model is all about sandboxing, doing away with the filesystem, and explicit permissions. Exactly what the web’s good for. They’re not only a good fit technically, but they’ve become the ubiquitous lingua franca among the programming community. The technologies are familiar, as are the patterns of UI design and code composition. Those patterns will continue to evolve with HTML5 and associated technologies. We’re just scratching the surface here; there are exciting times ahead! I’m not an official Googler yet, nor even a Noogler, as I’ve taken time off to chill, smell the roses, and pursue a few projects (like dusting off the homepage and … watch this space. Actually, watch that space). I’m starting in about a month. And of course, even when I am official, this blog continues to be my own opinions, caveat emptor yadda. The role covers EMEA and I’m still based in London. Despite not starting just yet, I’m looking forward to participating in tonight’s Chrome/Chromium OS and HTML5 London event. See you there! Around the time Ajax got coined, one of the already-known patterns was 37Signals’ Yellow Fade Effect. As techniques were shared and visual effects libraries emerged, we began to see visual effects become commonplace on the web. I documented four of them in Ajax Design Patterns: One-Second Spotlight, One-Second Mutation, One-Second Motion, Highlight. (I wish I called them something else, e.g. “Spotlight Effect”.) And all of these are around today, and even in the jQuery core which makes t hem pretty darn accessible to any developer. It’s as simple as $(“message”).fadeIn(). Where we are now, most developers are stuck with trial-and-error. In an ideal world, you’d have a SWAT team of UX experts to analyse each visual effect, test with users, and maybe they’d get it right, but most UI design in the real world and developers often just have to play around a bit and then move on to something else. So I think we could do with some simple guidelines, ideally based on empirical data, but even just based on pattern mining the web would be handy. Choosing Visual Effect. I want to update some content that’s just been received from the server. e.g. the football score changed. Do I show a yellow highlight, make it blink, make it vibrate, do nothing? Choosing Effect Parameters. I’ve decided to use a Slide Down effect. How longshould it last, i.e. the duration of time from not shown to show? Should it slide down at constant pace or accelerate and bounce at the bottom? Composing Effects I have a block of content with the user can edit. When switching it between edit and view modes, there are two simultaneous effects taking place – one thing is being hidden while the other is being shown. How do I handle those? Do I slide one up and when that’s done, slide down the other? Do I fade one out and simultaneously fade one in? Do I immediately close one and transition in the other, or vice-versa? Many options come into play. It should go without saying that there’s no right answer for any of these problems. But instead of developers always working from first principles, I think there are some very useful guidelines and discussions that could be had around the design patterns involved. Maybe even leading to a high level effects library supporting those patterns. To simplify TiddlyGuv message rendering, I made “SimpleMessagePlugin”. It removes the message box 1 second after a message was shown (using displayMessage). In the event another message appears in that time, it appends the message (as it normally does) and extends the message box’s lifetime by a second. In other words, it always closes a second after the last message was shown. The algorithm is a pretty similar throttling deal as Ajaxagram. View more documents from jeresig. Now using sizzle, the quick, generic (not just JQuery), selector engine. Slide 8 show s almost 2* performance improvement on IE6 from JQuery 1.2.6 -> 1.3.2. Ridiculous growth and market share (p15-17), and new big sites using JQuery (p13): Whitehouse, Wikipedia, Amazon, Microsoft. Not too shabby eh. Stuff like this makes it much easier for advocates to sell in their organisations. Setting up private CDN on Media Temple, who’s donating all the resources. More performance improvements in 1.3.3 – p23 shows 3.5x improment over 1.3.2! (perhaps for a subset, but it’s still a big and useful set). JQuery builds optimised for mobile. Moving parts of JQuery UI widget -> core. Four conferences in 2009 – online, London, SF, Boston. Better community sites, inlcuding online forum. Plugin site rewrite.